PerfectServe's fee for 24-hour coverage is about 50% less than the traditional answering service IPC was using. IPC/Senior Care of Colorado is a hospitalist practice specializing in geriatric patients. Around 50 practitioners care for patients in more than 100 facilities, which include primary care clinics, hospitals and medical centers, skilled nursing facilities, long-term care facilities, independent living residences and short-term rehab centers. 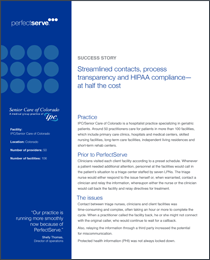 Before PerfectServe, contact between triage nurses, clinicians and client facilities was time-consuming and complex, often taking an hour or more to complete the cycle. Also, relaying the information through a third party increased the potential for miscommunication. Protected health information (PHI) was not always locked down. With PerfectServe, staff in all the client locations are able to contact practitioners directly, single number and be assured that they will reach the right practitioner. Each clinician decides how to accept his or her own contacts. Emergency calls go through the triage station so that they can be addressed immediately.